Sign up at Stakes Casino on our site to be able use the promos and coupon codes listed below. Stakes Casino is a dynamic and diverse casino that offers multiple playing platforms including Instant Play, Mobile Flash and Mobile Web. It is regulated by the government of Curacao and is licensed by Curacao eGaming. 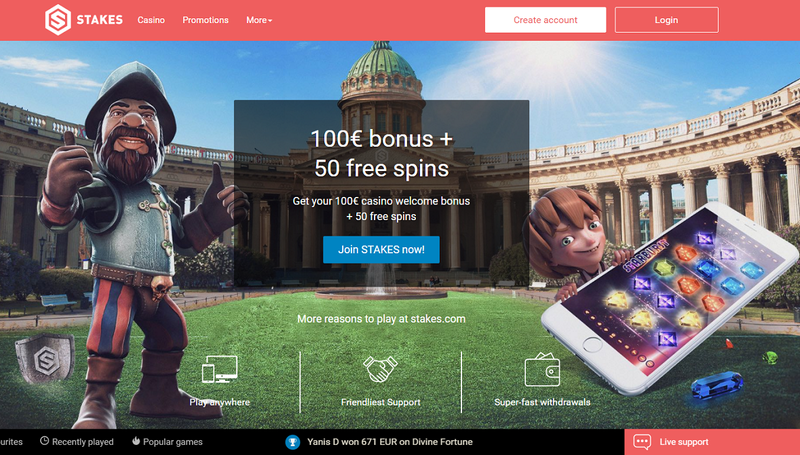 Stakes not only gives its players the chance to play the latest games from leading game's developers anywhere and at any time, but also offers awesome promotions and fast payouts. In fact, receiving winnings in a timely manner is a big part of the Stakes Casino online experience. The casino does its best to treat withdrawal requests within 24 hours. You can even withdraw the winnings of a bonus even if all wagering requirements have not been fulfilled. As for bonuses, stakes.com has many. In addition to a 100% casino welcome bonus, this destination has on-going weekly promotions as well as a sweet loyalty program. What you'll discover as you continue reading this Stakes Casino review is that there is plenty to play, enjoy and discover. There are plenty of fabulous Stakes Casino games that you can enjoy any time of the day or night from the comfort of your home or if you're on the go. The casino offers multiple playing platforms including Instant Play (Flash) for desktop, the Stakes Casino mobile web and mobile for iOS and Android compatible smartphones and tablets, as well as a live casino platform powered by Evolution Gaming. In addition to Evolution Gaming, the software developers behind the games at Stakes include well-known names like NetEnt, 1x2gaming, BetSoft, GameArt, Intervision Gaming, Microgaming, and RTG Gaming. There are over 950 games available at Stakes online, providing players with a bevy of diverse entertainment ranging from classic slots, video slots, table games and a slew of other betting games such as Keno, Bingo, Video Poker, and arcade games. Without question, video slots make up the bulk of the casino's games and include super titles like Koi Princess, Gonzo's Quest, 3 Kings, Lights, Sin City Nights, Fa Fa Twins, Star Cash, Guns N' Roses and hundreds more. While you can always enjoy the live casino, which brings you live dealer versions of blackjack, roulette, baccarat and poker, there are also well over a hundred virtual table games a click or touch away as well. Take your pick of several variants of poker, blackjack, roulette and baccarat as well as Craps, Red Dog and Casino War. 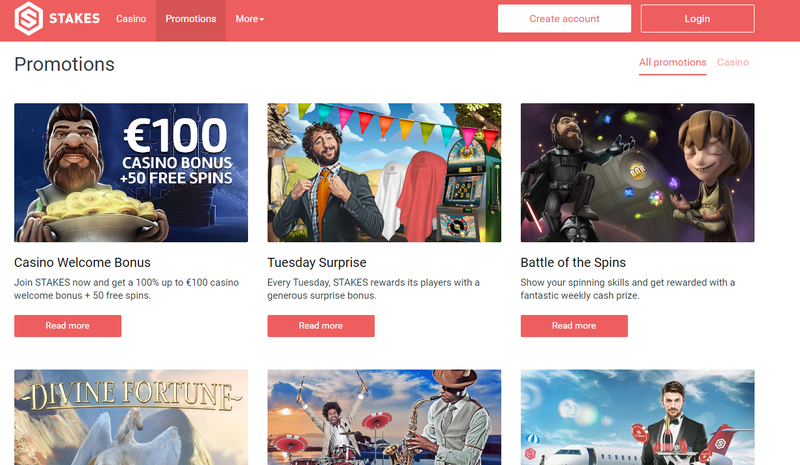 Get a 100% up to €100 casino welcome bonus + 50 free spins when you signup at Stakes Casino. What make this bonus even more rewarding is that you can withdraw your welcome bonus winnings any time that you want, even if the bonus wagering requirements have not yet been met. The amount of the bonus will simply be subtracted from your withdrawal. Plus, there is absolutely no wagering on wins from free spins, which means that whatever you win via these spins is automatically added to your real money balance (terms and conditions apply). A Stakes Casino bonus code does not appear to be necessary to claim this welcome bonus. However, should this change, we will provide you with this information. Aside from a casino bonus, there are ongoing weekly promotions that you can enjoy including a surprise bonus every Tuesday (Tuesday Surprise), a weekly cash prize (Battle of the Spins), the chance to earn up to 50 free spins on the featured games of the week (Game of the Week), and a special bonus offer each weekend (Happy Weekends). There is also a Loyalty Program at Stakes. it is free to join and - like most casino loyalty programs - you can earn different exclusive rewards and perks, such as cashback, more bonuses, etc., based on your loyalty status. Visa, MasterCard, Neteller, Skrill, Sofort, Bank Transfer, iDeal, Paysafecard, dotpay, Qiwi Wallet and Giropay are some of the Stakes Casino payment methods that you can use when transferring funds to your player account. Deposits are fairly quick and Withdrawal times vary from one method to the next. On the whole, eWallets such as Neteller and Skrill appear to be the fastest, with withdrawals times taking up to 24 hours, compared to up to 10 business day for credit cards. Stakes Casino customer support is available 24/7 and include both email and live chat. That being said there is also an FAQ option for players seeking self-help and you can also get in touch with Stakes via its social media page on Facebook and Twitter. Stakes Casino has supported play on mobile platform, you just hold your smartphone at the image area to get the direct link to Stakes Casino on your mobile. Stakes Casino has restricted from United States, but you can choose another casinos to play from your country.